1. In a medium bowl, mix mustard, wine, lemon juice, tarragon leaves and garlic powder. Set aside 1/3 cup for later. Add chicken to remaining sauce and toss to coat thoroughly. Cover and marinate in the refrigerator for at least 30 minutes. 2. Grill chicken 5 to 10 minutes on each side until cooked. Place vegetables on grill last 5 minutes of cooking. Slice chicken into strips. 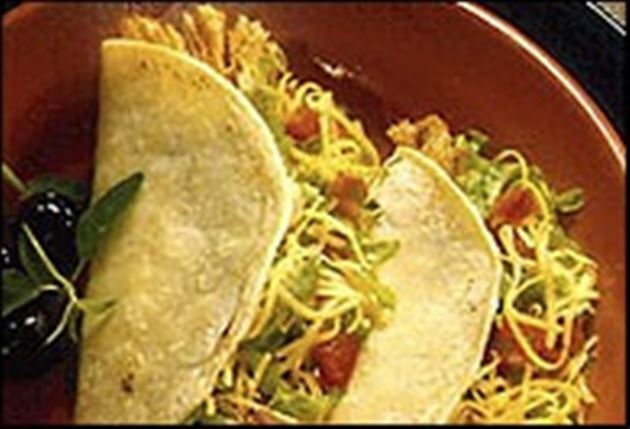 Place equal amounts of chicken and vegetables in warm tortillas and serve with reserved sauce and chopped lettuce. Top with cheese or sour cream. 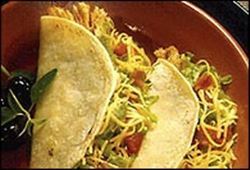 Enjoy this delicious chicken tacos Mexican recipe!